Doily Plate: Even though this cracked, I still really like it. 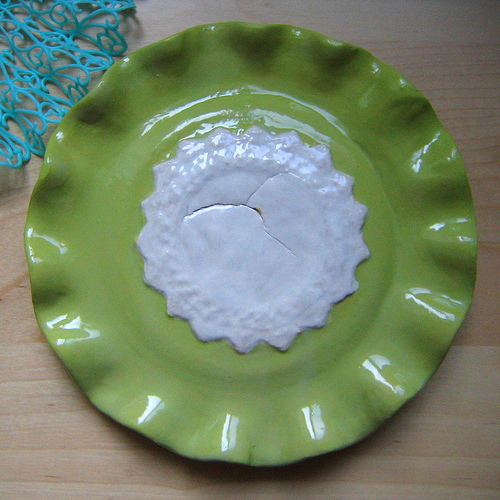 I threw the plate on the wheel, trimmed it, then added a slip-soaked doily to the top. Strangely the crocheted part made it, but the fabric part was too solid. It burnt away in the firing (as expected) and kind of feels like a sand dollar now. I still want to expirement with this technique in the future. I’m also quite happy with my little ruffly pie crust edge. I really love these little pyrex inspired dishes. The lace imprints on the inside didn’t show up as well as I’d hoped (in some cases) but they were lots of fun. I’d like to do more of these, too, and perfect my craftsmanship. I rolled lace into the clay and made the shapes, then painted them with an underglaze and carved the designs with a loop tool. 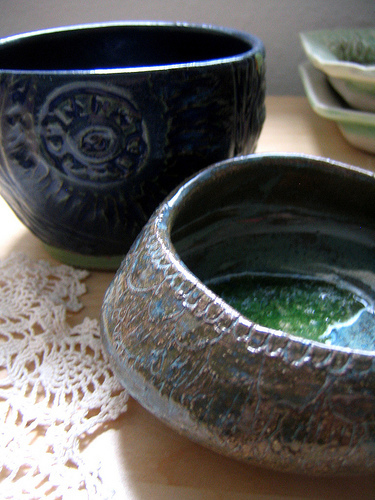 Once fired, I stained the lace impressions and dipped it in a clear glaze. 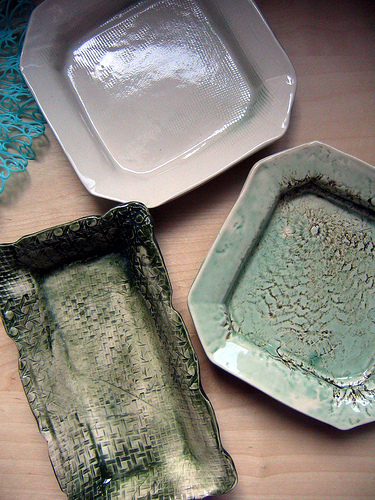 I also made these little porcelain dishes…same kind of idea with the lace and woven bamboo samples. The one that looks white was actually a little filet crochet imprint of a house, but I guess I needed to apply more pressure. Next time! 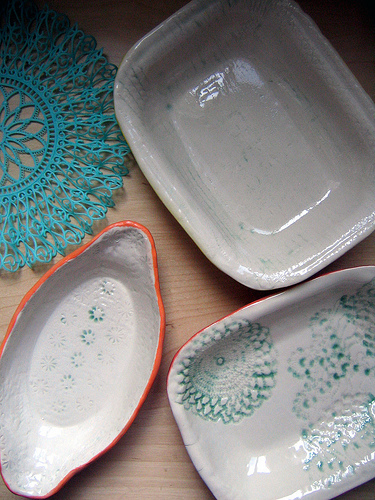 And here are a couple of my wheel-thrown bowls. The one on the right is my first successful bowl and I like its uneven sides and pod-like shape. I melted a glass marble in the bottom during the firing, which made the glaze flash green, so that was pretty cool and unexpected. There’s some carving that’s hard to see in the pic as well. The blue bowl was painted with an underglaze, carved, fired, then dipped in a midnight blue glaze. 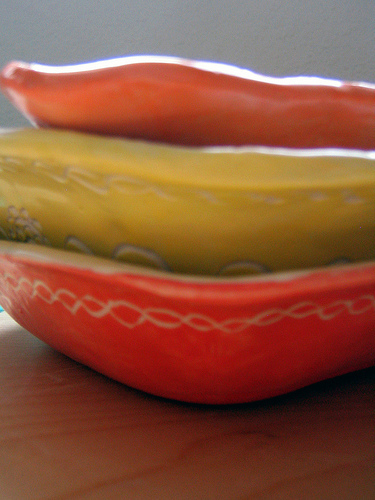 What’s really need is I could actually use these dishes and bowls in the oven and eat out of them, etc. For some reason I never do- but maybe this time. I think I may take another class and go for a big lasagna pan or something. Oh yeah, and if you’re a member of my family or a close friend, I should have warned you to close your eyes as these might be coming your way at the next gift-giving occasion. But you’ll probably forget by then, so it’s okay. WOW - these are beautiful. I want to make these too.. Don't give them all away - do keep some for yourself.